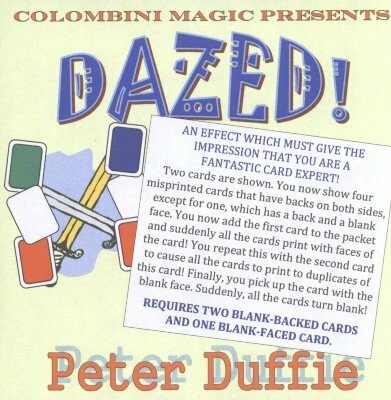 The effect was created by Peter Duffie. An effect which must give the impression that you are a fantastic card expert. Two cards are placed face up on the table. You now show four misprinted cards that have backs on both sides - except for one, which has a back and a blank face. You now add the first card to the packet and suddenly all the cards print with faces of the selection! You repeat this with the second card to cause all the cards to print to duplicates of this card! Finally you pick up the card with the blank face. "This," you state, "is an eraser!" You now prove this to be so because, suddenly, all the cards turn blank! You will require two blank-backed cards and one blank face card.